Moss is credited with revitalizing the industrial tract of Culver City. Eric Owen Moss structure in Culver City, California. 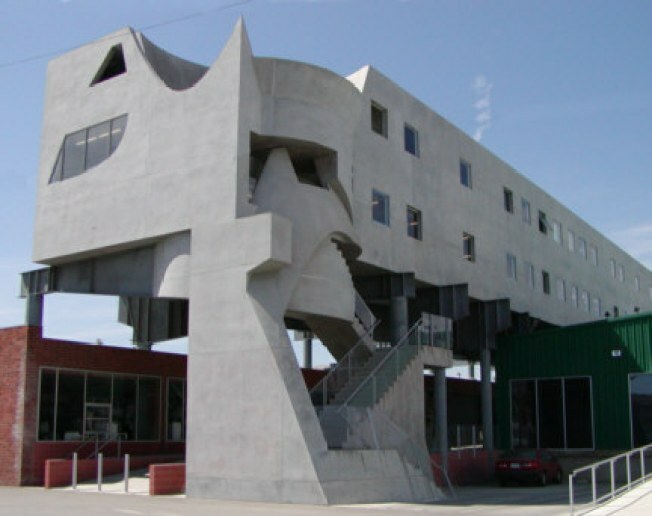 If you don't know the name Eric Owen Moss, you may know one of his Culver City buildings. Perhaps the "Stealth" -- a bold, geometric office building on Hayden at National -- or the Glass Tower, at La Cienega and Jefferson. Moss, the principal of Eric Owen Moss Architects and director of SCI-Arc (the Southern California Institute of Architecture) is widely recognized for helping to revitalize a once-defunct industrial tract in Culver City that's now part of the area's bustling core. Moss's work is now the subject of a book, the "Eric Owen Moss Construction Manual, 1988-2008," featuring 40 projects from his firm, which he founded in 1973. To celebrate the publication, SCI-Arc will host Moss, in conversation with KCRW's "DnA: Design and Architecture" host Frances Anderton, on Wednesday night. The lecture will be followed by a book signing and reception. Culver City-curious? Architecture buff? This event is for you. If you buy a copy of the book while you're there, you'll get 10% off. Wednesday, December 9, 7pm, W.M. Keck Lecture Hall, Southern California Institute of Architecture.